Everyone on the property must check in with front counter, sign waivers, and receive either watersports or land use wristbands. Anyone in the water must have a securely fitting Personal Flotation Device (Boating PFD or Diving BCD) on at all times unless under the direct supervision of an insured (and checked in with the office) instructor. Small non-motorized watercraft only (Canoes, Kayaks, etc). No large, unsafe, or motorized watercraft on the lake that create a hazard to others. The office staff will have final say on any watercraft allowed entry to the water. All animals must be well behaved, on a leash at all times, and use pet stations to clean up. *In the case of incliment weather (Lighting, Thunder, Ect.) all individuals are asked to exit the water. a 30sec recall will be used to announce that it is not safe to be in the water. We use a siren on a bullhorn along with tapping on a metal ladder for people underwater. Upon arrival at Kraken Springs, your first stop is the Main Office. Our staff will greet you and walk you through the registration process. Please see below for details. You will receive a colored band to be worn externally upon completion of required forms and payment. If you haven't been to our facility before please feel free to ask our friendly staff for an orientation of the lake and some of its features. All must check in with us prior to entering the water. You will be required to complete a liability release form, provide proof of diving certification (C-Card required) [If diving], and fill out any rental forms if renting gear from us. If diving Nitrox then you must also provide your Enriched Air Certification card. If renting a drysuit with us, you must also provide your Drysuit Certification Card. All divers that are minors must have a legal parent or guardian signature. 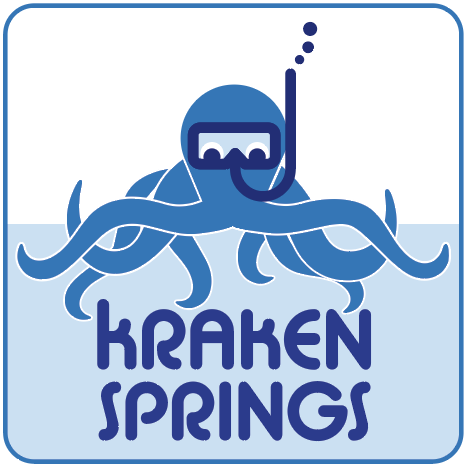 A dive buddy is required to scuba dive at the Kraken Springs and you may not enter the water without one for any reason. See below if you are a certified "Self-Reliant" diver. Our gates are shut at closing time. It is your responsibly to be out of water, gear packed up, and ready to leave before this time. We suggest you are out of the water no later than 3:30pm. No smoking within 25 feet of the Dive Shack, Bathrooms, Docks, or Set Up Shelters. Besides impacting divers breathing capacity, our air fill station may be filling cylinders with oxygen enriched air increasing the "naked flame" hazard. Self-Reliant (Solo) diving is STRICTLY limited to divers that have additional Self-Reliant, Solo, or Full Cave certifications. You must have an approved and verifiable certification that is presented at check-in that meets this criteria along with a full isolated air stage. There is a Self-Reliant waver to also sign. For more clarity on this policy or specific certifications allowed check out the FAQ page. Any diver found solo-diving without presenting approved credentials at sign in and having proper equipment (regardless if you have them) will result in full access being revoked without discussion. All that we need is a completed rental waiver obtained in the shack at registration. Staff will walk you through the easy process. All cylinders must have been visually inspected within the past year and hydrostatically tested within the past five years or we will not fill them. Your tank will be inspected before it is filled. If your tank fails the inspection process, we will discuss the options with you. Dive Georgia has our own VIP inspectors and can submit your tank for Hydrostatic testing. All Nitrox cylinder require a valid and current O2 clean service label marking along with the visual and hydrostatic labels from a service center that is a certified to provide such service (Such as if the service tech was certified by PSI and using a certified inspection label). If the cylinder is within standards we will be happy to fill via our pre-mixed bank system anywhere between 22%-40%. Unless we can verify via proper labeling that your tank meets current safety standards we will not be responsible for filling it. In thse circumstances we will discuss it with you and reccommend the cylinder be visually inspected and possibily O2 cleaned. At Dive Georgia, we have several PSI certified inspectors and are pleased to offer these service to our customers. Unfortunately some shops do not employ service personnel and use staff who have received on the job training. Generally they are not certified in cylinder inspections and O2 cleaning. While they may have "serviced" your cylinder and put a label on it due to their lack of certification we can't verify it's been done to industry standards. This policy is put in place to protect our staff and equipment when filling enriched air. If you require a Nitrox custom mix beyond 40% we are happy to provide the service as long as the cylinder has been O2 Cleaned and Visually Inspected by Dive Georgia PSI certified staff only (The cylinder will then have a Dive Georgia PSI service label). This is because mixes beyond 40% should be treated as pure O2. Blending Gas at this concentration requires special handling and and carries an enhanced risk of explosion if there are any contaminants are contained within the cylinder. This policy is put in place to protect our staff and equipment when filling equipment enriched air. Instructors must check in with us prior to diving and have a completed Kraken Springs Instructor Roster that includes their signature and signature of all of their students. All divers or students that are minors must have a legal parent or guardian signature on their paperwork. All Instructors must provide both their current certification card that includes any current year renewal stickers (PADI you must have "Authorized to Teach" status on PADI Pro Check online) as well as active instructor liability insurance. If you don't have these c-cards with you then you can not dive, instruct, or have students. Students may not check in without being accompanied by their instructor and the instructor is responsible for the safety, conduct, and behavior of themselves and all students under their care. Our gates are shut at closing time. It is your responsibly to ensure both you and all of your students be out of water, gear packed up, and ready to leave at this time. We suggest you be out of the water and have your class debriefed no later than 3:30pm. Kraken Springs is more than happy to accommodate Government Agencies with the unique training opportunities our quarry has to offer. Special rates and policies apply. All applicable forms must be filled out and reviewed by a staff member 7 days before the scheduled training date(s). Please contact us several weeks in advance of your prefered training date(s) for of staff to handle your team's needs adequately. Unfortunately there are no exceptions to the above policies. We demand high standards of both our staff and all guests diving with us. Violations Of Safe Diving Practices, Unsafe Actions, or not following any posted or Kraken Springs Staff instructions or policies may result in access being revoked to the quarry at the discretion of Kraken Springs Staff.